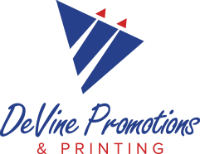 At DeVine Promotions & Printing it is all about us helping you promote your business, motivate students, inform and impress customers. We also understand that the value comes not only in the product, but also in the process. Getting quotes in a timely manner. Creative Consulting. Technical assistance. Cost saving. A friendly voice. These are just some of the reasons DPP continues to be a trusted supplier for clients of all types and sizes-individuals, small businesses, large corporations, schools and universities. Checks now available! Click here for more information.